The "Largest Cruise Ship in the History of Italian Shipping"
January 19 approved the issue of a letter of intent for the construction of a new ship at Finantieri. Value of the order is about $450 million. The 951-ft. (290- m), 112,000-ton vessel will be built in the Sestri Ponente yard in Genoa, sched- uled to enter service in summer 2005. Magica at the moment under construc- tion at Sestri Ponente. MW diesel electric units and will oper- ate all year round in the Mediterranean. Europe. We also continue our commit- ment to develop passenger ship building in Italy where Italy is the world leader. Magica which enters service at the end of 2004 our relationship with Fincantieri which started in 1992 with the building of Costa Classica and Costa Romantica continuous very satisfactorily." The order for the new vessel was also made possible by the recent harmoniz- ing of law and taxation in Italy. Europe enabling Italian flag ships to operate internationally in a stable and competitive climate. 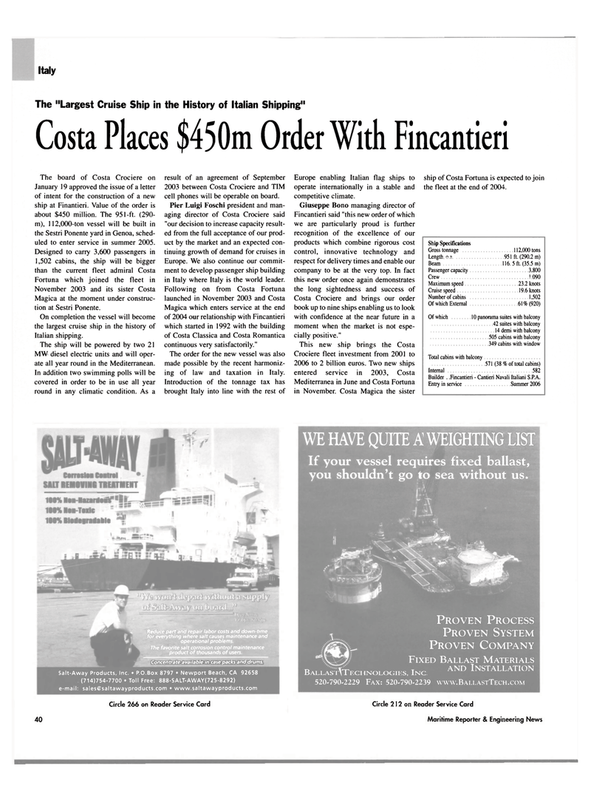 Costa Crociere and brings our order book up to nine ships enabling us to look with confidence at the near future in a moment when the market is not espe- cially positive." Mediterranea in June and Costa Fortuna in November. Costa Magica the sister ship of Costa Fortuna is expected to join the fleet at the end of 2004. Builder . .Fincantieri - Cantieri Navali Italiani S.P.A.
Reduce part and repair labor costs and down-time for everything where salt causes maintenance and operational problems. The favorite salt corrosion control maintenance product of thousands of users. Concentrate available in case packs and drums.